Okay, so Pulp had been chugging along since 1978 and changed styles (and majority of the members?) at least three times before getting into the big leagues of Brit-pop together with Blur, Oasis and Suede (and as can be gathered by my track-record I'm not a big fan of the Brits' pop). 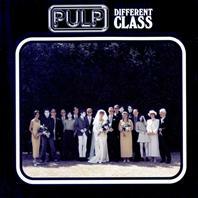 Different Class was their second release while in the limelight and their fifth since the debut It, twelve years earlier. I guess almost all of us has heard the blasé Common People and I can add that if you haven't then there's much you haven't heard on this album, cause the majority of the songs deal with the class aspect in one way or another and most of them are delivered in a very blasé tone of voice. but that's alright, you can fop till you drop, I guess.